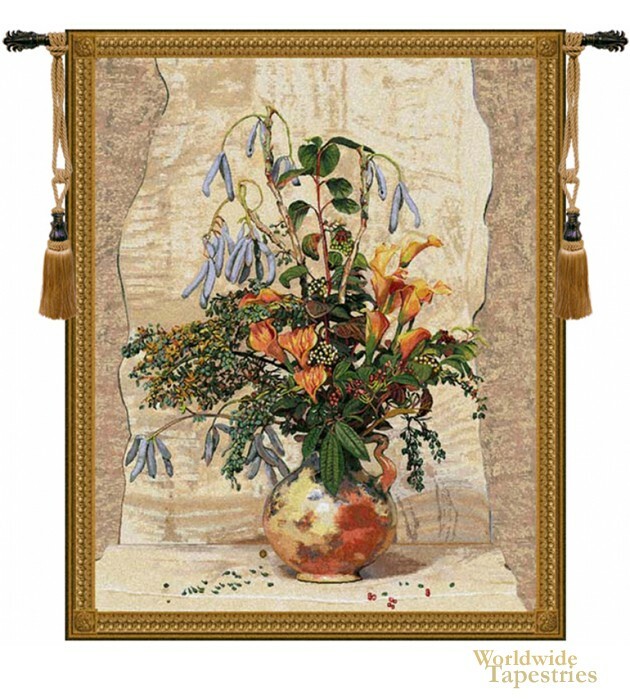 This floral tapestry Mobach, shows a bouquet of flowers in a copper vase, based on the work by Daniel Ost. Belgian based artist Ost, born 1955, specialises in art of flowers and landscapes with trees. His works have been commissioned by royal families, multinational organizations and even UNICEF. Here we see a collection of indigo and orange colored flowers with greenery on a copper colored pot vase. The design and use of color is balanced. The Mobach tapestry is backed with a lining and a tunnel for easy hanging. Note: tapestry rods and tassels, where pictured, are not included in the price. Dimensions: W 35" x H 42"